In Jigsaw, the thrilling new puzzle, Billy’s back and after a series of murders bearing all the markings of the Jigsaw Killer, law enforcement find themselves chasing the ghost of a man dead for over a decade and embroiled in a game that’s only just begun. Is John Kramer back from the dead to remind the world to be grateful for the gift of life? Or is this a trap set by a new killer with designs of their own? This classic episode of Rod Serling’s timeless science fiction fantasy and horror show The Twilight Zone featured much-loved actor Telly Savalas (On Her Majesty’s Secret Service, The Dirty Dozen) as Erich, the step-father of a little girl with a rather sinister doll. Pull Talky Tina’s string to hear the cutesy message ‘My name is Talky Tina and I love you”… unless you’re Erich that is. Despite her sweet yet mechanical voice, it seems Talky Tina doesn’t like her new daddy very much, and it’s not long before she lets him know it. The mild insults, “I don’t like you”, soon turn to murderous threats, and this being The Twilight Zone, it doesn’t end well for poor Erich. Before picking up a Best Actor Academy Award for his role as classic movie villain Hannibal Lector in Silence of the Lambs, Anthony Hopkins appeared in this twisted psychological horror. Billed as ‘A Terrifying Love Story’, Sir Anthony plays Corky, a magician and ventriloquist on the verge of a breakthrough when his severe psychological issues get the better of him. Fleeing back to his hometown, Corky meets high school crush Peggy and a romance blossoms which doesn’t impress Fats, his foul-mouthed, murderous dummy who seems to have developed a life of his own… Creepy indeed. With the creative team of Steven Spielberg and much missed Texas Chain Saw Massacre director Tobe Hooper behind it, Poltergeist was destined to be a horror classic for the ages. Concerning an all-American family whose house is plagued by supernatural forces, the film is packed with memorable scenes - but perhaps the scariest features a clown doll that terrified a generation of '80s kids. Robbie, the family’s youngest son, understandably doesn’t like the creepy clown at the end of his bed and tries to cover it up when he goes to sleep. Feeling something isn’t right, young Robbie takes a final furtive glance at where the doll should be, only to see an empty space and hear a noise coming from beneath his bed… and then things go downhill fast! From master of imaginative, physical-effects-filled horror Stuart Gordon (Re-Animator, From Beyond), Dolls is a visual treat for horror fans. Stranded in the English countryside during a terrible storm, an eclectic group of travellers find themselves stuck at the gothic mansion of a kindly old couple. The elderly hosts turn out to be toymakers, but their creations are not all they appear. The dolls they create house the souls of the wicked, and they’re ready to kill anyone else who doesn’t pass the test and prove themselves worthy of life… An overlooked gem. Freddy, Jason, Leatherface and… Chucky. This 1988 horror introduced the world to a demonic doll who would prove able to stand toe-to-toe with genre giants, despite his diminutive size. When serial killer Charles Lee “Chucky” Ray is fatally shot in a toy store, he uses his knowledge of voodoo to transfer his soul into the body of a ‘Good Guy’ doll. When the doll is bought by single mother Karen the next day and gifted to her six-year-old son Andy, all hell breaks loose. Chucky comes to life to get revenge on those who wronged him and anyone else that threatens to get in his way. Interestingly, Chucky himself didn't appear on the film's poster clearly, but this original movie is still the best. Another popular franchise, the Puppet Master series currently stands at a staggering 12 entries, with the thirteenth currently in production. Puppetmaster features not one but five terrifying nightmare dolls - Pinhead, Blade, Miss Leech, Jester and Tunneller - each with their own unique methods of killing their victims. These murderous puppets are the creations of puppeteer Andre Toulon, who died hiding his secrets from the Nazis at the outbreak of war. In the present, a group of psychics are out to discover the dead man’s secret of giving life to inanimate objects, but not if his puppets have anything to say about it… ahhh! 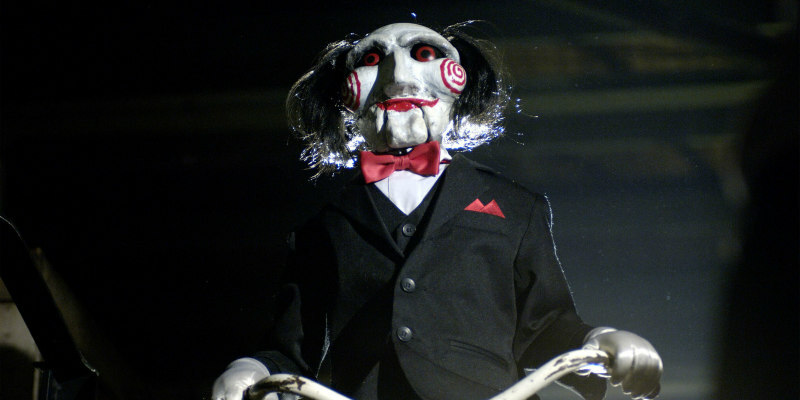 It seems director James Wan and writer Leigh Whannell, the creators of Saw, weren’t finished with scary dolls after introducing the world to ventriloquist’s dummy Billy back in 2004. The pair returned a few years later to introduce the world to a brand new character… a ventriloquist’s dummy named Billy! So there may be some rather obvious surface level similarities at play, but this is a very different movie centred on the curse of murderous ventriloquist Mary Shaw who was lynched, turned into a dummy and buried with her 101 dolls. Now she’s back to seek revenge on the bloodline of those that humiliated her in life. Saw fans note, the original Billy doll can be seen somewhere in this film. Director James Wan has had a hand in every major new horror franchise for the past couple of decades and it seems he has a thing for creepy dolls. Not only did he create Saw, and executive produce Jigsaw, but he also tackled evil puppets in the aforementioned Dead Silence, demons in Insidious and ghosts in ‘true-life’ tale The Conjuring. Annabelle, a doll first seen in The Conjuring, would go on to gain new life as the star of her own film series, which began with this 2014 offering. Acting as a prequel, the film follows Annabelle as she is gifted to an expectant mother who is then terrorised by the demon that accompanies the creepy porcelain doll. It seems dolls still rule our nightmares! Jigsaw is on Digital Download 19th February and DVD, Bluray, 4k, Steelbook & Box-set on 26th February.